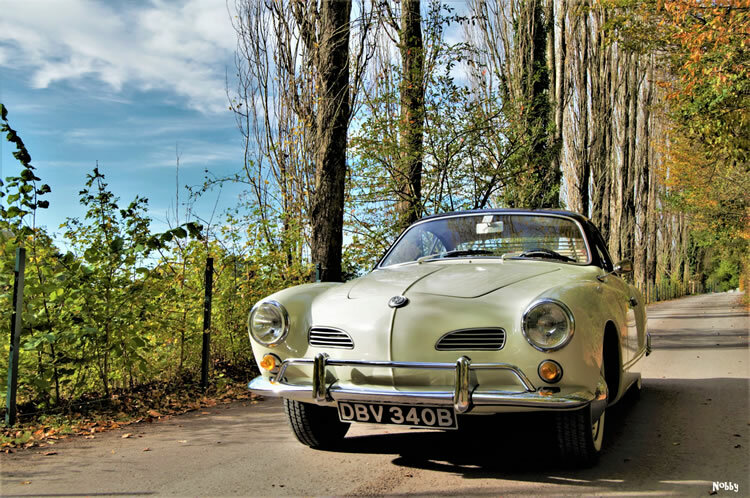 The Type 14 Karmann Ghia closely followed the Beetle in terms of its year by year changes and technical development. However it never acquired the MacPherson-strut front suspension as this would not fit under the wings. August 1955 / 1956 model year – Introduced with 1192cc / 30bhp engine, manual transmission with non syncro first gear. Beetle torsion bar suspension front and rear but with the addition of a 12mm front anti roll bar which the Beetle did not have until 1960. An external “swan neck” mirror fitted on the drivers wing was offered as an option. 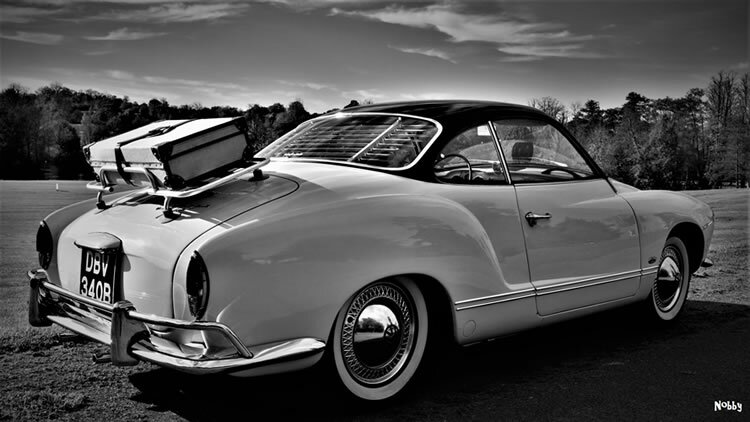 August 1957 / 1958 & 1959 model year – Introduced the Cabrio version. Cost was DM8250 / £1280, DM750 / £115 more than the coupe. Additional strengthening in the chassis and body was required which increased weight. 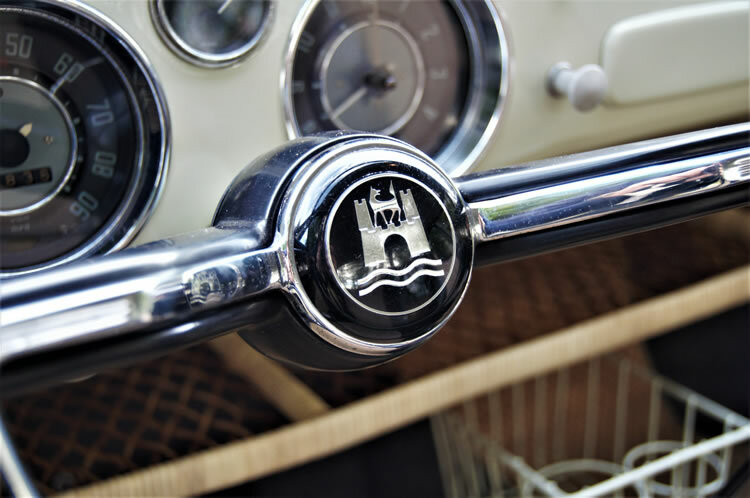 For both models, a circular fuel gauge was provided on the dash, the steering wheel became dished rather than flat, and fitted with a semi circular horn ring. The interior door panels became vinyl covered, replacing the earlier fabric type and an armrest fitted to the drivers door replacing fabric door pull, passenger door had armrest from start. The flat accelerator pedal replaced the old roller ball system and the clutch was improved to make it lighter to operate. Brake shoes increased in width and additional soundproofing fitted between the engine and the cabin. Upper part of dash padded added in January 1959. August 1959 / 1960 model year – The most obvious change was moving the headlights 45mm higher on redesigned wings with the front air vents enlarged with new chrome trim, but also the rear lights were increased in size. Other improvements included a steering damper, windscreen washers as standard, opening rear side windows on the coupe and headlamp flasher on the indicator stalk. The reserve fuel tap was deleted. The Right Hand Drive of Coupe and Cabrio became available. August 1960 / 1961 model year – The new 34bhp engine (still 1192cc) was introduced along with a revised all syncro gearbox, with suitably updated ratios. A smaller Karmann Ghia script on the engine lid. 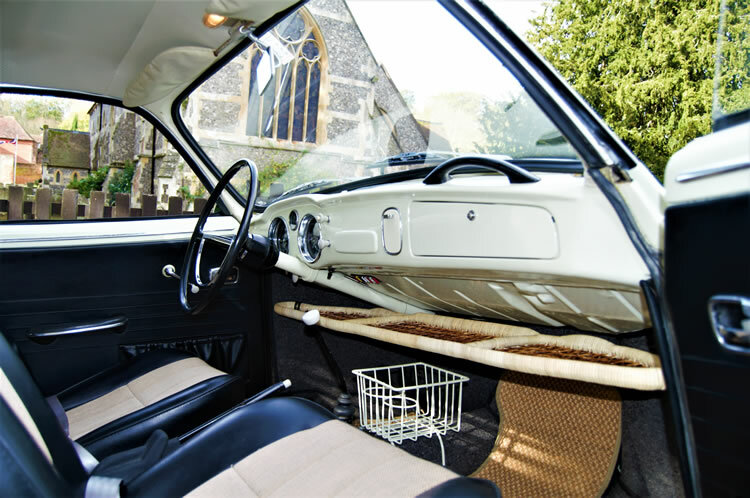 August 1962 / 1963 model year – Additional noise insulation fitted along with seat belt mounting points (seat belts were optional extra). August 1964 / 1965 model year – New chassis numbering system with 3rd digit referring to model year. Horn ring changed to horn bar. Heating knob changed to two vertical moving levers either side of the hand brake. Rear view mirror gained chrome housing and sun visors swivel to side. August 1965 / 1966 model year – New 1285cc engine (know as the 1300 with a badge to match on the engine lid) with 40bhp output increased performance significantly. The front suspension changed from king & link pins to maintenance free ball joints. The external mirror changed to a short arm mounted on the drivers’ door, the horn ring became semi circular again and the ashtray moved to below the dash rather than in it. One year only chrome trim runs across dash. August 1966 / 1967 model year – Another engine change, this time to 1493cc (know as the 1500) with 44bhp and the final drive ratio increased to give a top speed of 82mph. Introduction of front disks, dual circuit brakes and 4 bolt mounting all wheels. Rear axles longer to widen rear track and rear suspension modified with equaliser spring to minimise oversteer. Dash given fake wood grain covering and large speedo flanked by smaller fuel gauge and clock. Two speed wipers and modified door locks. Steering lock in place of transmission lock. Improved front seats with adjustable backrest. 12 volt electrics on US models. August 1967 / 1968 model year – Fuel tank filler in front wing, 12 volt electrics for Europe and 3 speed semi-automatic gearbox option. Hazard lights as standard, bonnet release relocated into glovebox. New dashtop pad with integrated grab handle. Change of external door handle with dished recess into door skin and release on hidden trigger rather than button. August 1968 / 1969 model year – Fuel filler flap has internal pull ring release. Cabrio has glass rear window (previously plastic), radial ply tyres as standard. Heater outlets in sills moved back under door. IRS rear axle. August 1969 / 1970 model year – 1584cc (1600) engine producing 50bhp. Wrap round front indicator lights and longer (250mm) rear lights including reversing light. Heated rear window and speedo with trip odometer. VW1600 badge on rear. Removable plastic water tray on inside of engine lid. August 1970 / 1971 model year – Seats are all leatherette (no cloth inserts), carpet goes from loop pile to felt type. August 1971 / 1972 model year – Rear lights from Type 3 saloon, 350mm tall, ‘Europa’ bumpers with rubber insert. Instruments from Type 4, wiper switch on steering column stalk. New 4 spoke safety steering wheel, removal of woodgrain dash replaced with black vinyl, fresh air vent changed to rotary knob, improved seats. August 1972 / 1973 model year – Nickel plated silencer. Impact bumper mounts and deletion of rear seat on US cars (to meet US regulations). Larger brake failure warning light. Please note that some changes occurred later for different markets and ‘old stock’ was often used up on early cars from the new year change so there can be variations from these dates / changes. 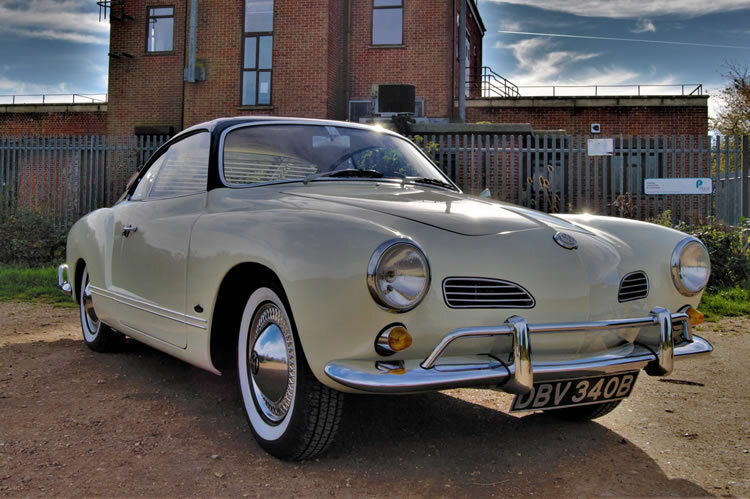 Please note all the above refers to production at the Karmann factory at Osnabruck in Germany. 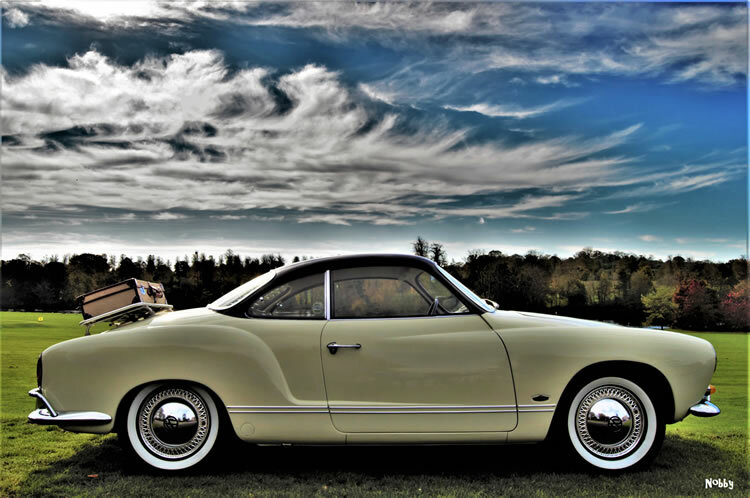 In addition Type 14 Karmann Ghias coupes were produced at the Brazilian factory from 1962 to 1972 and followed similar production upgrades. 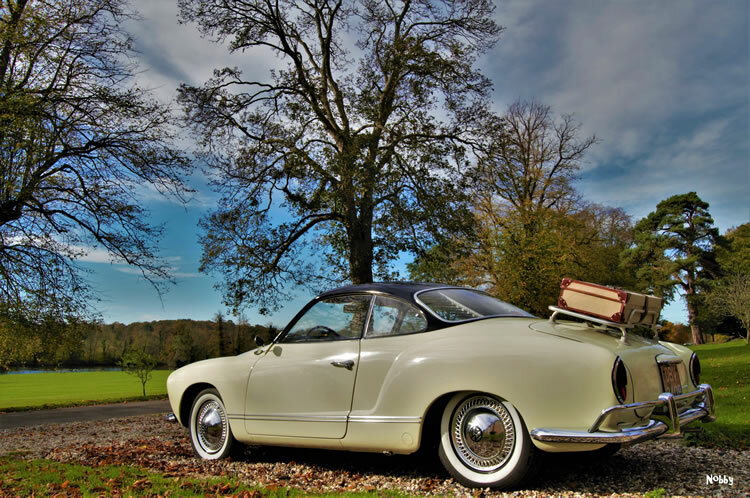 23,373 coupes and 177 cabrios were built there, plus 18,119 Type 145 TC (Touring Coupes) from 1970 to 1975.